Stock trading is easy - it can be learnt in a day by following online stock brokers instructions for their trading platform. Learning to invest in the right way is another story and can take years. We were asked by our readers who want to invest on their own to share an insight into a process followed by Niveza Research Desk. Its a lot of work and needs time to follow these steps but there are no shortcuts to success. Also, dont forget emotions are your worst enemy when it comes down to picking the best stocks and more importantly exit them. The first thing that should be figured out is the health of the economy and whether you should be investing at that time. Analysts often refer this as a macro economic picture. Many economic activities are linked to each other. You will have to monitor policy changes by the government, central bank, statistical data like inflation numbers, employment data, import-export data, currency rates, etc. for Indian as well as global markets and especially countries which have a significant impact on Indian market like United States, European Union, etc. If your market analysis has determined that the market is in an uptrend and likely to continue for some time, you want to buy stocks in those sectors and industries that are showing the best potential to be big winners in the uptrend. Also, always remember that a market which is climbing higher will not ensure that all stocks will perform well. It is hard to determine whether a company's stock would be a good buy if you don't actually understand what that business does or how it makes money. On the other hand, if you understand the business, you can use that knowledge to your advantage. For example, if you like smart phones and if you like to read about them, you're probably in a good position to compare companies that make them. Remember, a strong company doesnt mean it is a buy; it can be expensive and would not deliver good returns. A bad company will rarely be a good buy especially for the long term even if it is trading at a cheaper price. Warren Buffett is a famous example of this creed. He never invests in any business which he doesnt understand. Over the years, Information Technology (IT) companies have made plenty of money for the investors, however, Buffett stays clear of investing in IT companies because he doesnt understand how it functions. If he is not able to understand the business operations he will never be able to assess its performance and understand its growth potential. The most important part of stock investing requires us to figure out how much stocks are worth, and whether the trading price is fair. We prefer value investing strategy of the Worlds best investor i.e. Warren Buffet for arriving at the fair price of the stock. Check the bottom line. The difference between revenue and expenses is a company's profit margin. A company that's growing revenue regularly while controlling costs will also have expanding margins. The analyst typically refers this as bottom line since its the last line on income statements. Another important point is Price/Earning ratio. P/E ratio is the key indicator of relative valuation based on earnings. ROE. ROCE are some other important ratios related to the profitability of a company. A high P/E ratio generally means that investors expect a strong growth in the future for a company, and as such might be willing to buy the stock at the premium. However, a high P/E ratio doesn't always mean that a company is overvalued, nor does a low P/E ratio automatically mean that it's undervalued. How much debt is eating into profits? To understand the debt of the company, check the company's balance sheet. Generally, the share price of a company with higher debt is likely to be very volatile as more of the company's income has to go to interest and debt payments. Compare a company to its peers (competitors in the same segment) to understand if it's borrowing an unusual amount of money for its industry and size. Dividend growth might be an indicator of health. An investor should look if a company is regularly paying a dividend, and also if they are increasing a dividend or not? If a company is not paying a dividend it doesnt necessarily mean its bad thing. Growth companies tend to deliver better returns in terms of price appreciation by reinvesting profits. Dividends are typically paid by large and well-established companies who generate excess cash and may not be able to generate better returns by reinvesting. The second stage is to choose the businesses which you can fully comprehend. While the ones you choose might reflect your personal objectives, your appetite for risk, or interests, in general, there are certain key components that make companies successful. One such key characteristic is having a competitive advantage. A competitive advantage is essentially a leg up over similar businesses, and the more sustainable a company's competitive advantage, the more likely it is to remain profitable in the long run. For example, one well-known company with a sustainable competitive advantage is Bharat Forge. Bharat Forge is a part Kalyani Group which is USD 2.5 billion worth.It is a market leader in Indian forging business with a strategic global footprint across Germany, France, and Sweden.Owing to its strong capabilities in the domain of engineering, R&D and manufacturing process, it has transformed itself from being a supplier of the component to a preferred development partner. It is one of the best players in terms of operating efficiency among peers thanks to its strong business model. It enjoys operating profit margin and net profit margin of 28%/14% respectively which is higher than peer range of 10-22%/ 2-10%. Strong business model, market leader position, and operational efficiency makes it value added pick among peers. One of the most important aspects of stock analysis is to understand the company and its management. Management teams are responsible for making strategic decisions that impact the value of their companies over time. That's why it's important to find companies with strong leadership teams. As you do your research into who's running the companies you should check for the manager's track record, experience, and if he/she has any specific talents. You might also find yourself drawn to managers with certain characteristics. RBL Bank Ltd. is the best example of a successful business story under great leadership. After 2010, the company witnessed growth in topline and bottomline as well under the new leadership of Vishwavir Ahuja. Vishwavir Ahuja is a successful banker with rich experience in banking and has earlier headed Bank of Americas India operation. In last seven years, he has built a strong team with rich banking experience. During this period, net profit of the bank has risen to Rs 446 cr in FY17 from Rs 12 cr in FY11 with the growth rate of ~70% vs de-growth rate of ~27% over FY06-11. If your stock investment strategy involves identifying stocks you can hold over a long period of time, you will need to identify stocks of companies which offer the best growth opportunities. In such cases, focus on businesses that are expected to accelerate at a faster rate than their competitors, thereby generating, or having the ability to generate above-average earnings. Identifying growth drivers and coming up with financial projections is probably the hardest part of picking right investments. To explain this point in detail, let's continue with the same example of Bharat Forge. There are many growth drivers like - replacement demand pull up, pick up in infrastructure activity, low fuel prices, lower interest rate, healthy economic growth supporting company fundamental. The company is placed well with a sustainable business model, sound financials and competitive advantage in positive industry scenario. In the case of Bharat Forge, it will be safe to say that the company has robust fundamentals and good growth drivers which will ensure that there will be sustainable growth in the future. The stock market can be pretty volatile space of investment, however, the good news for the investors is that in the long term, investors who buy stocks tend to better returns. That's why it's important to come up with a long-term investment strategy. One of the most simple ways that we recommend: Find great companies to invest in, and hold onto their stocks for the long term. In spite of numerous downturns, the Indian stock market has a strong history of bouncing back, so if you are willing to be patient and ride out the uproar that inherently comes with stock investing, you stand a strong chance of profiting. A good way to learn more about the companies you are interested in is by tuning in to the earnings conference calls. Typically, businesses conduct conference calls on a quarterly basis, usually following the release of financial information. During these conference calls, management will discuss the latest financials, major factors that impacted performance, and projections for the upcoming quarter or year. Tuning in to a conference call can give you a good sense not just of how a company is doing financially, but how management responds to changes in performance, for better or worse. This is important because it's possible for a company to have strong earnings in one quarter and poor earnings the next, but the way management addresses hiccups can have a huge impact on a company's long-term value and viability. Most companies post their conference call schedules on their websites and allow investors to listen online. Identifying great stocks is a very complicated process. Sure it's rewarding, but at the same time, it can also be pretty risky. Hence, every investor should make it a point to safeguard his/her interest. If you put all of your money into an individual company's stock and its price falls, you run the risk of losing your entire capital. To counter this, you should build a diverse portfolio to increase your opportunities for growth while minimising your investment risk. If you buy stocks in multiple sectors, you reduce your chances of your portfolio taking a major hit if a certain sector tanks. Once you buy stocks, it's natural for you to want to know how your investments are doing. However, checking your investments portfolio on the daily basis is a good way to drive yourself crazy. If you plan is to hold your investments long-term, then there is no point in checking daily or even weekly price fluctuations. However, it's always advisable that you should check on your investments regularly to see how they're doing. Also, don't just check your portfolio for its current value, it makes sense to check up on the companies whose stocks you hold and then look out for potential roadblocks. As much as selecting great investments is hard, even harder part is admitting your mistakes. Have a set of criteria that will tell you it's time to sell: If the company cuts its dividend; if the price rises or falls to a certain point; if a stock analyst downgrades the stock you are holding, etc. Just like buying, having a perfect plan for selling will help you avoid selling stocks out of panic over a short-term move in the stock market. Hopefully, our 10 step approach will put you and your money on a better investment path, however, remember picking good investments is one of the hardest tasks in the world since stock prices depend on a lot of things going on in India and around the World. You are not alone if you find it hard to consistently beat the market over the long run; only 4-5% of professional analysts manage to do so. 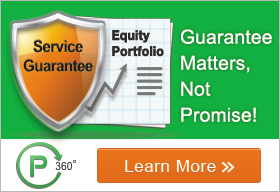 If you are interested in subscribing to premium equity research but cant afford to block the cash for years then you could consider our v360 short term research calls or if you are interested in the long term investments then m360 multibagger research calls would be a better option for you.